Circumpolar; Alaska to Labrador and Greenland, south in North America to Saskatchewan, Nebraska, Missouri, Illinois, Ohio, West Virginia, and North Carolina. Occurs along the coast and wet interior regions at all elevations. Common in moist to wet forest, swamps, thickets, openings, slidetracks, stream-banks, gullies, meadows and clearings. 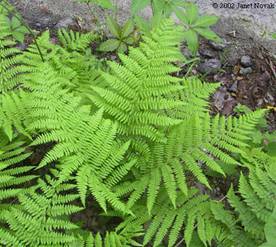 Lady Fern is relatively tolerant of sun and dry soil as compared to many other ferns. A. Goeringianum pictum; A. alpestre; A. crenatum; A. macrocarpum; A. niponicum; A. spinulosum; A. umbrosum. May be collected as: By division in the spring or spores may be sown in the summer. The spores must be fully ripe. Place fronds with the spores in a paper bag and dry for a week at 21ºC. Collect spores that fall into the bag. Athyrium can be transplanted in the spring or fall; however, division is best attempted in the spring, shortly after new growth has emerged. Spores may be stored in a dry, cool place. Pojar, Jim and Andrew MacKinnon. 1994. Plants of the Pacific Northwest Coast Washington, Oregon British Columbia & Alaska. BC Ministry of Forests and Lone Pine Publishing, Vancouver, British Columbia, Canada 527 p.